Yes, the good news is that we’re in the lucky position of now being able to benefit when our volunteers, friends and supporters are shopping online. And the even better news? It won’t cost anyone an extra penny to do so! A while back we teamed up with Give as you Live and we’re now getting the party started! Like our fundraising through Smile.Amazon, Give as you Live offers a similar way for us to raise funds without asking our friends and supporters to part with any extra money. Yes, simply by shopping online for items you’d have been buying anyway, you could be raising money for us. Give as you Live is an online shopping platform which links to over 4,000 online stores. When you use our link to shop at any of these stores through the Give as you Live platform, any purchase you make tracks through to generate free funds for us. Use this PLIRB LINK to visit the Give as you Live platform. If you think it’s a good way to shop and donate at the same time, we’d appreciate it if you could register to use Give as you Live. Their process is pretty easy and as long as you’ve used our link to access the registration page, you should be able to see that you’re supporting us through our name and information at the top of the page. After this, you’ll be able to browse the stores and choose your favourites. You can then log straight into your Give as you Live account each time you want to shop and one of these stores, and a donation will automatically be made to us. From holidays and travel, to clothing and gifts, everything you buy which is tracked through Give as you Live will raise funds for us. Don’t worry if you forget to use our link or if you want to get your friends donating and start telling them all about it rather than sharing the link. 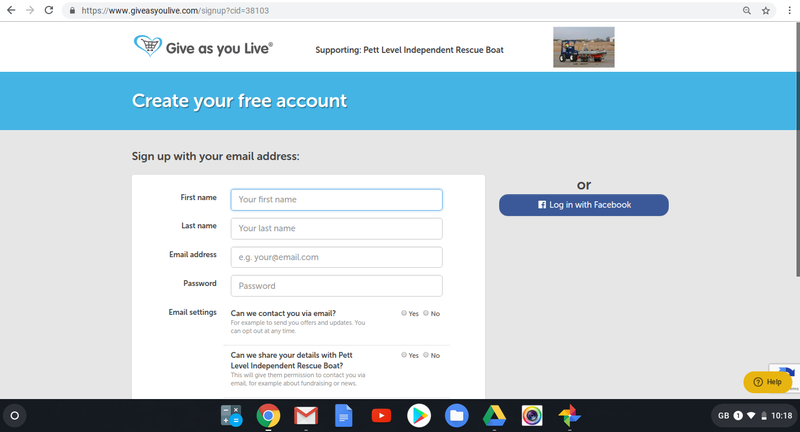 It’s fine to just register with Give as you Live then, from ‘inside’ the platform, it’s just a case of searching for us and nominating us as the chosen charity for donations. This how-to post has been saved as a page for future reference, but we’ll also be putting reminders and updates on the blog every now and again. Until then, if you could share this page and our GAYL link with your friends, that would be amazing – and much appreciated! For now though, we’d just like to say thank you so much for helping us out with this … and happy shopping! On Thursday 21st February, we were delighted to pop up to the Two Sawyers pub in Pett, to present a certificate of thanks for recent donations. The Two Sawyers have been taking donations into a custom-made donation box, all of which has added up to a recent donation of just over £100 to us. A short certificate presentation, and a celebratory round of drinks (mostly soft ones, of course) took place as we said thank you to the team at the Two Sawyers. 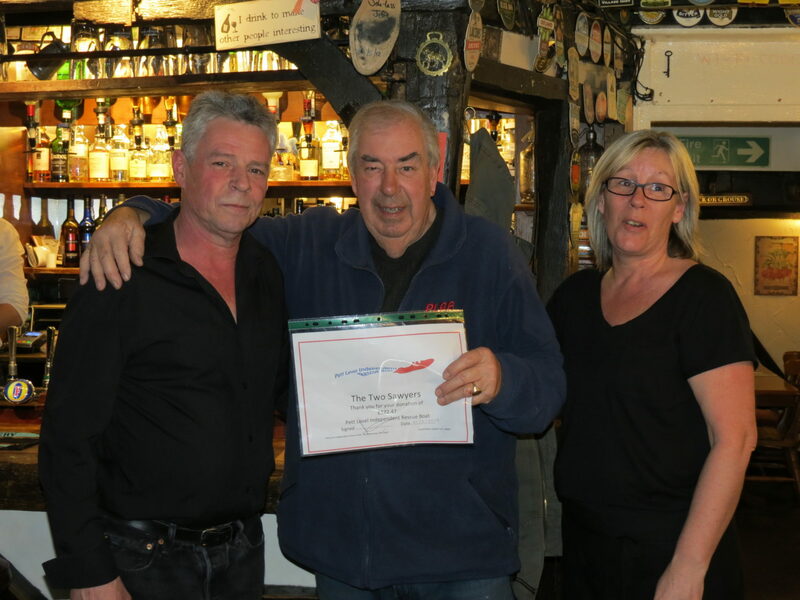 Publican and owner Mark Fleischer and barstaff Karen are pictured receiving the certificate of thanks, along with Dave Martin, PLIRB chairman. 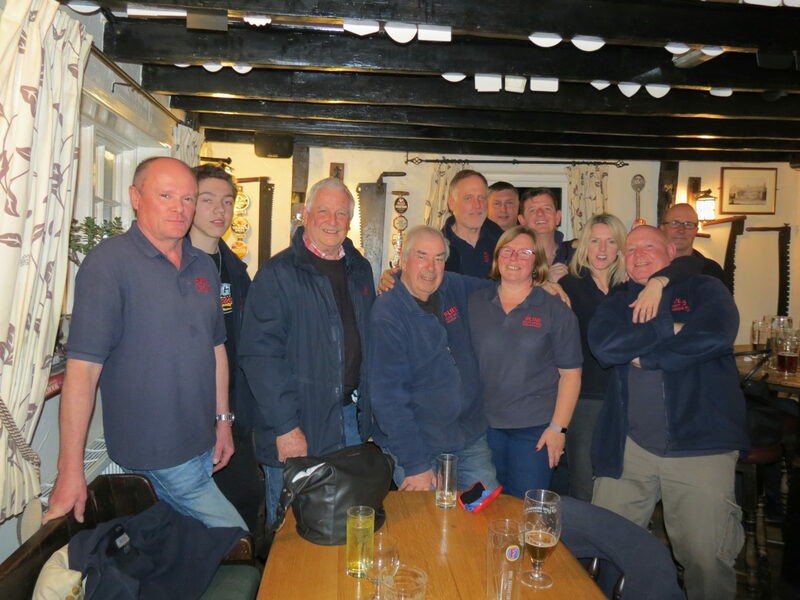 Everyone here at Pett Level Independent Rescue Boat would like to say a very big thank you staff and customers of the Two Sawyers – this local community support is sincerely appreciated and makes a considerable difference to what we’re able to achieve in replacing vital equipment and providing an essential independent local rescue service along the local coastline (and beyond). We really couldn’t do it without this kind of support, thank you all very much. This Sunday, the weather was wet and a little windy, but compared to the recent thrashing from Storm Erik, the whole beach seemed remarkably calm. 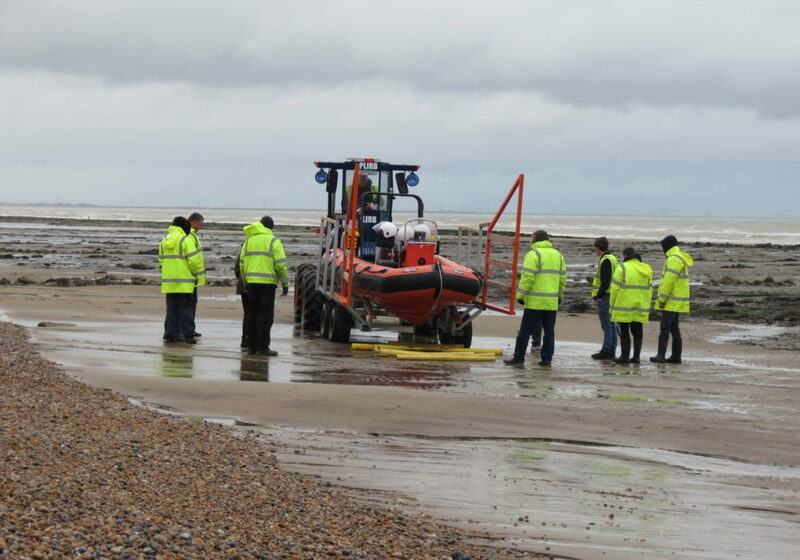 However, the point of the tide at the time of training and the fact that further high winds were predicted, meant that we focused on ‘dry’ training. For those of us who completed first aid training last summer, it’s useful to revisit everything in the kits. For those who have not yet completed first aid training, seeing what’s in the kits is useful pre-training and familiarisation. It’s good-practice to check through the first aid kits to check that everything is present and in-date. Then training moved onto knot-practice for volunteers who still need to rehearse this as part of their training, whilst essential maintenance on the vehicles was carried out by our mechanic volunteers. 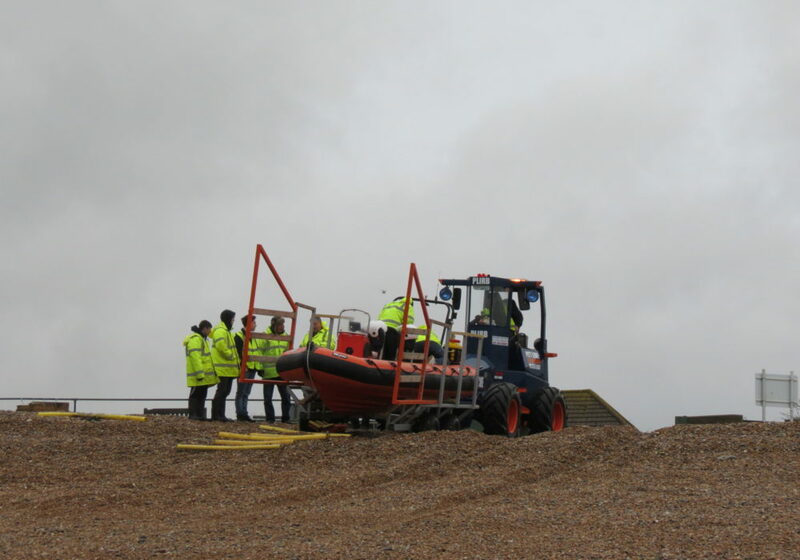 Other trainees were also given GPS training, as knowing the techniques as well as the technology is also a vital part of success at sea. Then it was time for a debrief and planning for future training. 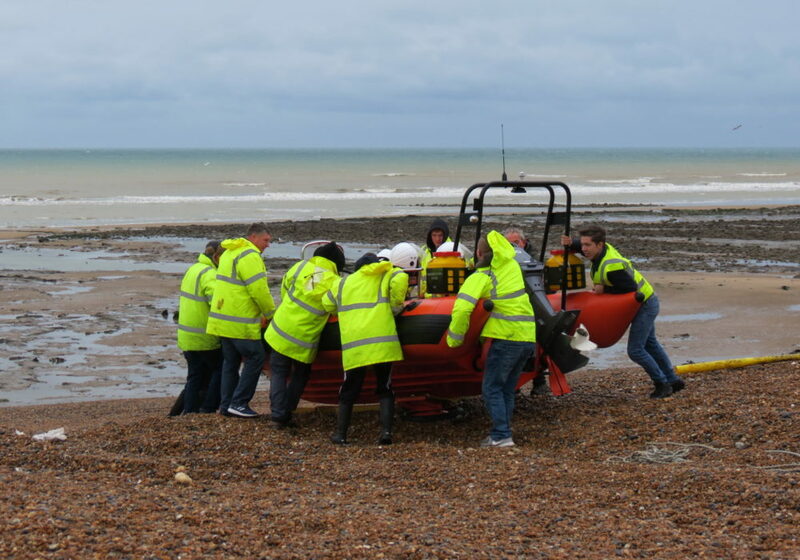 The next one’s coming around soon as we’ve also got mid-week training during the coming week – with our re-visit to RNLI Hastings on Thursday 14th (yes, a real save-the-date moment with our RNLI colleagues). We’re looking forward to this, particularly seeing their wonderful Shannon boat, and will update on here to share how the training goes. We’re also planning another night-training session in the next few weeks, tide, moon and weather permitting. After such a long winter, it’s strange to now be trying to schedule this in for this month or the very start of March before the clocks change again! In all, it was a busy morning at the boat house, with plenty going on and a considerable amount of planning for future work. If you’d like to be a part of it all, please contact us. On Sunday 3rd February, we were delighted to have a visit to the base from the wonderfully supportive team at Dynamic Events in Rye, who came to present us with a marvellous cheque for £2022.90. 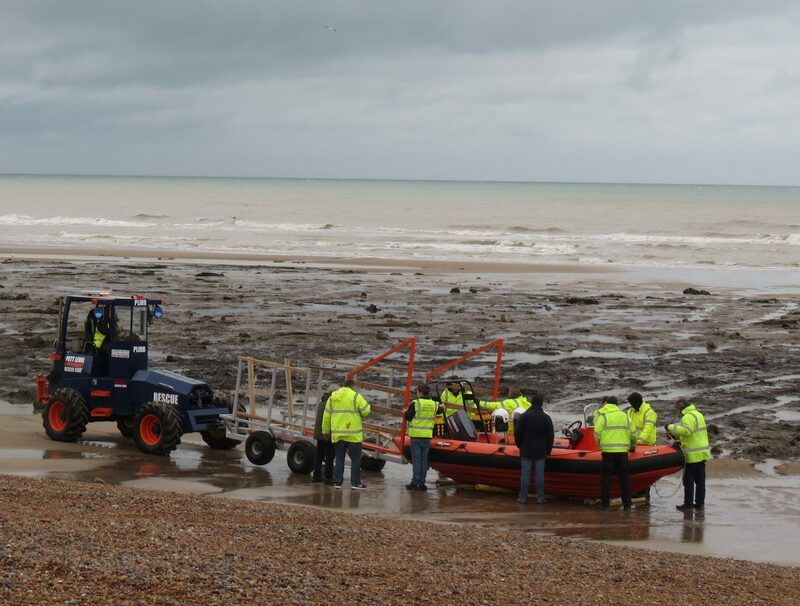 This very welcome donation is the result of some very hard work fundraising on behalf of Pett Level Independent Rescue Boat, as an independent rescue charity. It all began last summer when the staff team at Dynamic Events decided to take part in September 2018’s Dragonboat Race at Bewl Water. However, when asked which charity they’d be fundraising for, they had a little trouble deciding. But staff member Jo Stapley, who also happens to be a trainee crew volunteer here at the PLIRB, was quick to share with her colleagues our efforts in raising money to buy and refit a reserve launch & recovery vehicle. Once Jo shared this water-themed cause, and the question was put to a vote, Jo’s colleagues were quick to get on board with the idea, with PLIRB winning the vote as the chosen charity. As we shared at the time, the Dynamic Events Dragonboat was manned (and of course womanned) by a superb crew of Dynamic Events staff, PLIRB volunteers, plus a few interested (and very helpful) families and friends to make up the numbers. Despite coming in last in every race, this fabulous crew had a fantastic time and managed to raise a significant sum for us whilst doing so. In fact, now that all of the monies have been collected and counted, Dynamic Events were able to donate a cheque for £2022.90, which is an amazing result for all their hard work in raising funds with quiz nights, fun events and a dedicated GoFundMe page. As the top photo shows, several Dynamic Events staff members came down for the presentation whilst many of our boat and base crews, including Jo Stapley, were also down at the base for our usual Sunday morning training. It was great to be able to get together and enjoy some early spring sunshine and receive (with grateful thanks) the cheque. Everyone here at Pett Level Independent Rescue Boat would like to say a very big thank you to all concerned at Dynamic Events, as well as all those who supported their fundraising with donations and sponsorship. This kind of support is sincerely appreciated and is really making a difference to us in what we’re able to achieve in replacing vital equipment and providing an essential independent local rescue service along the local coastline (and beyond).